Kimball Office is committed to quickly and easily providing the sustainable information you need. We’re excited to announce a partnership with ecoScorecard, a web based tool that provides environmental product information and sustainability documentation for LEED and other third-party rating systems. ecoScorecard includes information for not just office furniture, but also for other building components that contribute to a sustainable office space. By compiling sustainable information from a single source, such as ecoScorecard, hours, weeks, and sometimes months can be reduced in the documentation process for new construction or remodel projects. This time savings can contribute to reduced project costs for building owners, architects, designers, product specifiers, and dealersalespersons. 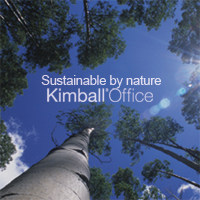 Specific product information on Kimball Office products will be included in ecoScorecard by mid-November. If you have questions or need more information, please email the Kimball Office Customer Care team or call us at 800.482.1818. The Kimball Office team would be glad to assist you!